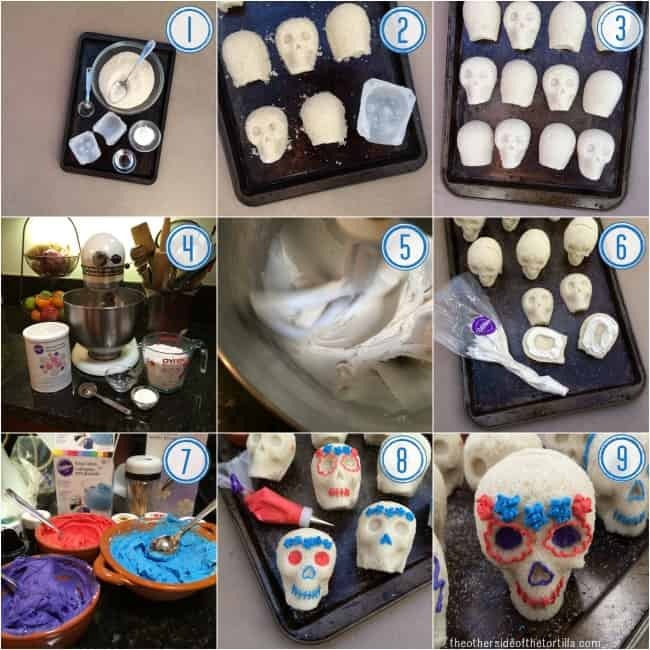 You can see my full step-by-step photo tutorial of how to make sugar skulls for Day of the Dead on latinamom.me. Here’s my recipe for making sugar skulls and royal icing. The sugar I used to make the skulls was provided by Zulka, my favorite brand of non-GMO Mexican cane sugar. I received a sample but this creation and my opinions are my own. 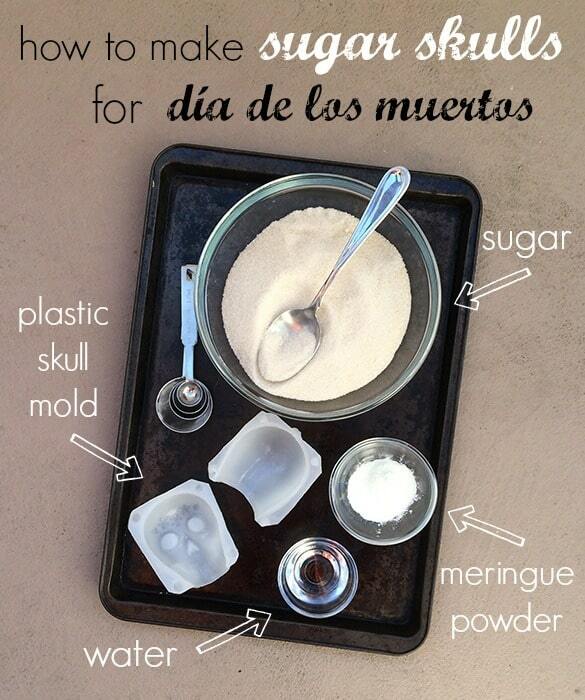 Make your own sugar skulls to decorate your altar for Day of the Dead. Mix dry ingredients, then add water and mix until sugar has a crumbly, wet beach sand consistency. Fill your skull molds, pressing tightly into the mold. Flip the molds onto a flat surface and allow to dry 8 hours or overnight. Brush the excess sugar away and then use royal icing to cement the front and backs of the sugar skull together, and colored royal icing to decorate. These are not supposed to be eaten, as they are for decoration, but if you can't resist the temptation, all of the ingredients are edible (just be careful not to chip your teeth on hardened royal icing). Make your own royal icing to assemble and decorate sugar skulls for Day of the Dead. Beat ingredients on low-speed in a stand mixer for 7-10 minutes or until stiff peaks form and the icing looks more like a consistent paste. Use about half of the plain white royal icing to cement the front and back of the sugar skulls. Divide remaining icing into separate bowls and use a toothpick to transfer icing colors into the royal icing. Incorporate well with a butter knife or small spoon until the color reaches the desired hue and the color is consistent throughout. To dilute the icing a bit to make it easier to pipe in disposable decorating bags, use fresh lime juice (squeeze a little at a time and mix well to incorporate). The lime juice will cause the icing to glisten, which is normal. The prep time accounts for how long it takes to make the icing, use icing colors to color the icing to be used for decorating, and to fill the disposable decorating bags. It does not include the time it will take to actually decorate your sugar skulls; time for that can vary greatly depending on the level of detail you would like to decorate your skulls. I used a medium-sized 3D sugar skull mold purchased from Viva Greetings. I used Zulka azúcar morena, which was sent to me by the company to use. I used Wilton disposable decorating bags, and reusable couplers, round decorating tips (though I’ve used the open star tip and the drop flower tip in the past as well), meringue powder and icing colors.